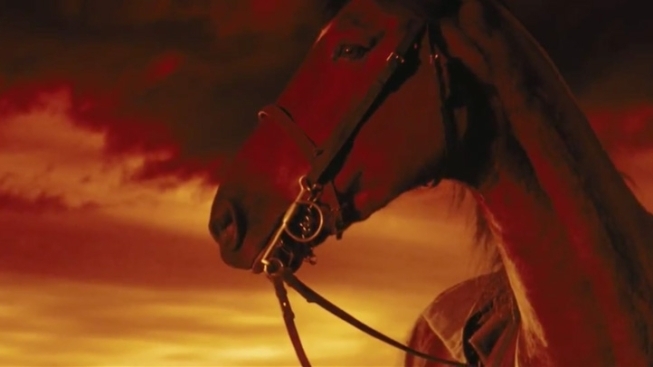 Steven Spielberg’s adaptation of the hit play “War Horse,” the story of a boy and his horse torn apart by World War I, is a long slog of improbabilities, followed by a gorgeous 10-minute set piece, all wrapped up with an overlong coda that makes a blatant grab for the heartstrings. Spielberg is an unquestionably gifted filmmaker, with a mastery of the medium’s technical demands. While there’s no single moment of “War Horse” that isn’t expertly done, the sum falls well short of the whole of the parts. Ted Narracott (Peter Mullan) is a hard-drinking man who, in a fit of pique, buys at auction a gorgeous thoroughbred, Joey, that is both way beyond his means and il-suited to the job of plowing a turnip field. It’s soon left to his teenage son, Albert, to train the horse and convince it to till the rocky field. The success of this mission so grabs the imagination of the townsfolk that everyone comes out to watch how it goes—we won’t spoil it for you. But ultimately the horse is sold to Capt. Nicholls (Tom Hiddleston), who plans to mount the mighty steed and charge into battle against the Jerries. As the years pass, the horse encounters all manner of horrors, and eventually Albert finds himself joining the fight. Will the boy and his horse find each other?!?!?! As is his custom, composer John Williams’ has written a score that is the very essence of overwrought, swelling a handful of times before anything of note happens. The effect is to preemptively sap whatever power the music may possess long before the action calls for it. And the cinematography of Janusz Kaminski is equally over-the-top. Kaminski must’ve spent the bulk of the shoot lying on the ground, or possibly hired the cast of “Somewhere Under the Rainbow” to man the cameras. Not since TV discovered the Dallas Cowboy Cheerleaders have we seen so many low-angle shots setting the action against a backdrop of blue sky. Like any war story, “War Horse” is ultimately out to deliver an anti-war message, and it does so beautifully. When young Joey gets entangled in barbed wire out in the middle of the battlefield, soldiers from each side of the fight meet in the middle to do what they can for the suffering beast. It’s so well crafted that it could easily stand on its own as a short film. And that’s a big part of the problem, as there’s zero connection between it and the hour-plus that precedes it, to say nothing of the ensuing 20 minutes. "War Horse" opens everywhere December 25th.